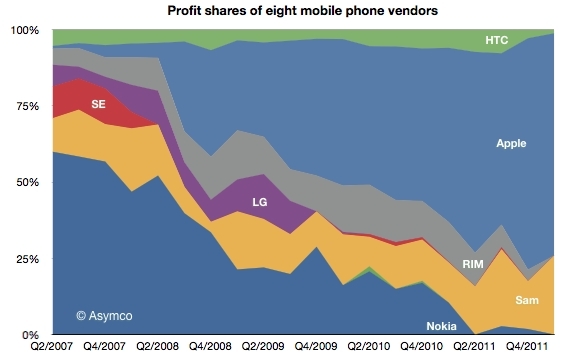 Looks like it's a grim time to be a mobile phone manufacturer if you are not Apple or Samsung. 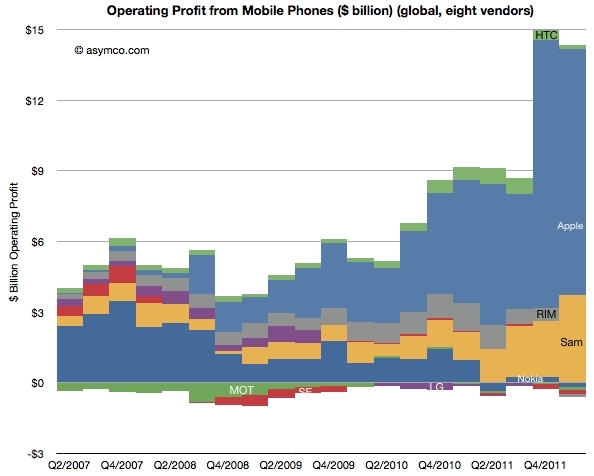 According to the latest report by Asymco, Apple and Samsung accounted for 99 percent of the total mobile phone profits, with HTC taking the remaining 1 percent. Out of the 99 percent Apple took the majority of it with an astounding 73 percent, with Samsung being left with the remaining 26 percent despite being the world's largest mobile phone manufacturer right now. As mentioned before, HTC took 1 percent out of the total and everybody else, including RIM, Nokia, LG, Motorola and Sony Mobile reported a loss in the first quarter. With the launch of the Galaxy S III and the HTC One series phones, these two are likely to expand their share of profits over the coming quarters. However, it is going to take quite a bit of effort to dethrone Apple from the number one position, which it has managed to maintain despite not having the greatest market share. For a more detailed analysis, click on the source link below.